In this April 14, 2017, file pool photo, former New England Patriots tight end Aaron Hernandez turns to look in the direction of the jury as he reacts to his acquittal for the murder in the 2012 deaths of Daniel de Abreu and Safiro Furtado, at Suffolk Superior Court in Boston. Hernandez's murder conviction for the previous killing of Odin Lloyd was dismissed after Hernandez was found hanging in his cell several days later. 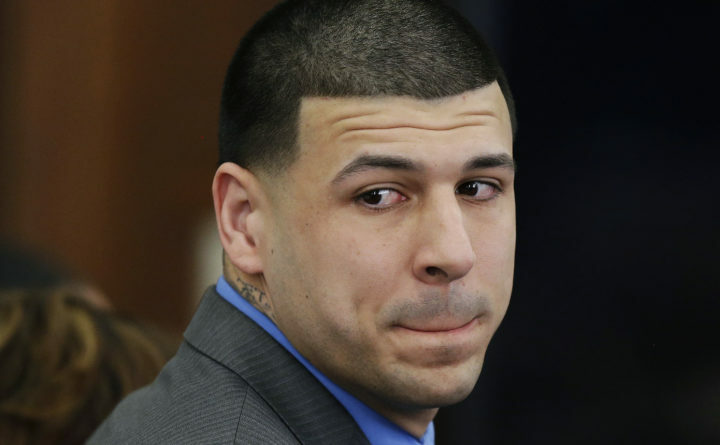 BOSTON — Massachusetts’ high court will consider whether the state should get rid of a centuries-old legal principle that erased Aaron Hernandez‘s murder conviction after the former New England Patriots tight end killed himself.